Chios is part of a regional unit with the islands of Inousses, Andipsara and Psara in the Northern Aegean. Its impressive total area of 842.5 square kilometres makes Chios the fifth largest island in Greece. The northern part of Chios has mountain ranges with the peaks of the Pelinneo Mountain reaching a height of more than 1000 metres. The South is characterized by a virtually endless high plateau, while further inland the island is less mountainous. Chios has beautiful coastal scenery as well, for instance the two charming bays of Kolokythia and Langada. The earliest archaeological finds on the island date back to 3000 BC. Around 700 BC Chios became an important centre for trade and economy, due to its favourable geographic position. The island’s newly-found wealth was based on slave trade, and most people find it hard to believe that the beginnings of slave trade date back to this Northern Aegean Island. Apart from the main ferry port in Chios Town, the island’s National Airport, only about three kilometres from the centre of Chios Town, provides excellent connections served by Olympia and Aegean Airlines. Sights not to be missed include the monastery of Nea Moni dating back to the 11th century and a UNESCO world heritage site, and a time journey back to life in the Middle Ages in the mastic villages of Mesta, Vessa, Olymbi or Pyrgi. Scuba divers consider Chios as one of the most fascinating diving places in Europe. The water temperature is perfect, and there is a multitude of underwater caves, steep rock faces and entire landscapes revealing an intriguing new world under the sea. About 11 kilometres south of Chios Town lies the Agio Fotia (Fotini) Beach that counts amongst the most beautiful beaches on Chios. It has small pebbles and crystal clear, deep water. There are numerous hotels and apartments on the beach, as well as restaurants and taverns offering fresh seafood and fish. “The Twins” is a tavern in Agia Fotia that is always worth a visit, as the food is truly delicious, whether it is fish, Greek salad or cheese balls that take your fancy. Agia Fotia is very much a tourist resort, there are very few historical sites in the vicinity. But on the beach holiday-makers can hire deckchairs and sun shades and there is a variety of water sports available. Chios Town is the most important economic centre of the island of Chios. The town occupies a coastal stretch of about 8 kilometres, with a very popular 5 kilometre beach. 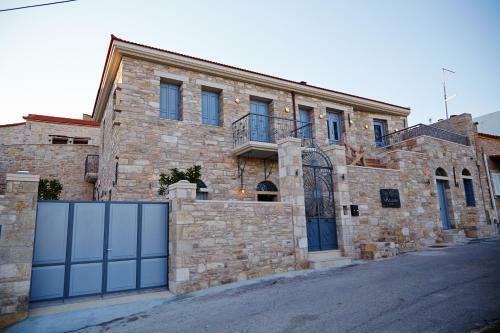 Cultural highlights in Chios Town include the cultural centre “Homerio” for exhibitions, the archaeological museum for treasures found at local excavation sites, e.g. the temple of Apollo or the fortified tower of Dotia. The municipal art collection and the nautical museum are very interesting too, the latter showing preserved parts of ships and even entire sailing-ships and steamers, all telling the story of the nautical tradition on the island of Chios. Daskalopetra lies in the northern part of the town of Vrontados on the eastern coast of the Eastern Aegean Island of Chios. Daskalopetra means “Teacher’s Stone” and this is what you find on the eastern coast of Chios: it is a rock with a smooth surface that looks vaguely like a throne. The ancient poet Homer is said to have taught here. A few metres to the side there is a stone altar with a grooved surface, dedicated to the goddess Cybele. Cybele was the Phrygian mother of the Gods, and worshipped with orgiastic celebrations and sacrifices. Daskalopetra has a long white pebble beach with intensely blue transparent water. Daskalopetra is famous for its perfect conditions for scuba diving, as indeed is the entire island of Chios, but swimmers and snorkelers get their money’s worth too. Daskalopetra has an idyllic little harbour with a few bars and taverns where you can sit in the shade by the sea and enjoy a delicious meal or a drink. The island also has a good selection of hotels in various price ranges. The small natural harbour of Emporio goes back a long time in history and is situated at the southern tip of Chios. As early as the Bronze Age, there used to be a spring in the centre of the settlement that made life a lot more comfortable in combination with the fertile soil and the harbour. Nowadays Emporio is a pleasant seaside resort with a few taverns here and there, small shops and holiday villas. Particularly popular is the nearby beach of Mavra Voila that consists of dark lava pebbles along crystal clear water which earned it the nickname of “Black Balls”. This unique landscape is a favourite with divers and snorkelers who come to explore it, and with the idyllic situation and a breath-taking view of Mount Profitis it is hardly possible to imagine a beach that is more beautiful. Around lunchtime and the early afternoon, the dark pebbles on the beach get very hot and create a nice contrast to the cold water. Karfas is situated in a bay on the east coast of the Eastern Aegean island of Chios. Karfas is one of the big tourist centres on the island of Chios and offers many hotels, restaurants and taverns that serve typical Greek specialties and fresh seafood, as well as cafes and bars where you can have a refreshing drink and enjoy the view of the glittering blue sea. The beach of Karfas is one of the most popular and best-known beaches on Chios. The sandy beach slopes gently into the shallow sea which makes it ideal for families with children. The Eastern Aegean Sea is crystal clear and equally inviting for swimming, diving and snorkelling. The beach is spacious enough for games as well as deckchairs and sunshades for those who want to relax. In the vicinity of Karfas is another very popular tourist centre in the town of Avia Ermioni. For those who like to party, Karfas offers numerous bars and discos that are open all night. 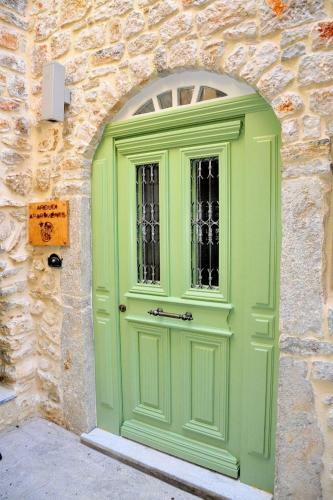 Every visitor is made to feel welcome in the medieval village of Mesta on the island of Chios. Formerly known as Amista or Lamiste, this quiet little village has just under 500 inhabitants today. The most famous sculptor in the village is Sergis Patenas; his stone sculptures show scenes from the past and of Greek history. The summer months are the festival season in Mesta where everybody celebrates and has fun. The 5th of August is the date of the biggest religious festival in honour of the Panagia (Holy Mary, mother of Jesus). Those who want to be part of this unforgettable event, are well advised to book a table at the local tavern. The village of Pyrgi is about 24 kilometres south of the town of Chios. It is a medieval village that was named after the central medieval tower in the centre. The stone houses in the village are built very close to each other to form a defensive wall. Walking through the narrow, stone-paved lanes of Pyrgi feels like going back in time. Amongst the churches, the byzantine church from the 13th century is particularly impressive. But the time tunnel reaches a lot further back than the Christian Middle Ages. Excavations have revealed the sanctuary of Leukothea, the white goddess, in her human shape Ino, the daughter of King Kadmos of Thebes. According to Greek mythology, Ino was the sister of Semele, one of the many humans that Zeus had an affair with and fathered Dionysos. After the jealous Hera, Zeus’ sister and wife, had caused the death of Semele, Ino and her husband Athamas fostered their nephew Dionysos. As a punishment for this, Athamas was driven into a mad rage and killed one of his children, whereupon Ino grabbed the other child and leapt from a cliff into the sea. The sea-gods welcomed her as Leukothea, and as the white goddess, she became the patron of sailors. From the ancient settlement, only a few houses have been discovered; but Leukothea’s temple and altar have been fully excavated. For those interested in Greek mythology, Pyrgi is the place to visit, and accommodation, cafes and some excellent taverns are available as well.